Set up your data source. Authenticate with Smartsheet (using Option 1 or Option 2). To create a data source using Smartsheet, go to the Service Connectors page in Klipfolio and select Smartsheet from the list of connectors. There are two ways you can authenticate with Smartsheet. 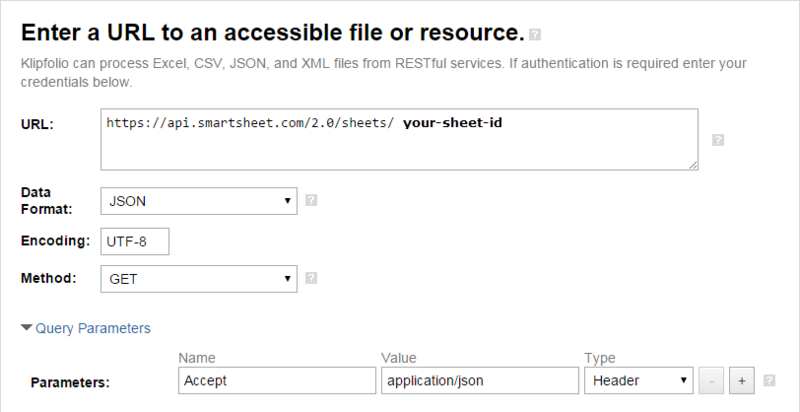 The most common way is to generate a Smartsheet OAuth token (Option 1). Or, use an API Key to authenticate (Option 2). Note: We are experiencing intermittent issues with Smartsheet OAuth authentication. An alternate method of authentication is with an Access Token (Option 2). Create an OAuth Token for Smartsheet. Under Type, select the option OAuth Credentials. Select Smartsheet from the list of Service Providers. You will be prompted to log in to Smartsheet. After logging in, you will be prompted to allow Klipfolio to access your Smartsheet account. Save and name your Smartsheet OAuth token. An alternate method is to generate an Access Token in your Smartsheet account and use it to authenticate in Klipfolio. Under Value, enter your API Token in the following format: Bearer your-API-Key. Replace your API Key with the Access Token in your Smartsheet account. Note: There are many Smartsheet query options for you to retrieve data. Consult Smartsheet API Documentation for more details. At Data Format, select Excel. Expand the Query Parameters menu. At Parameters, under Name, type Accept. Go to the specific sheet that you want to get data from in your Smartsheet account. On the left side menu, select the Sheet Actions icon. Add your Sheet ID to the query in Klipfolio. Although it is easier to work with Smartsheet data in Excel format, you can adjust your query to return data in JSON format. Parameter settings: Name = Accept, Value = application/json, and Type = Header. By default, most endpoints return a maximum of 100 records per query. To retrieve all records, append the includeAll=true parameter to your query. Index endpoints (typically those that return lists of objects such as sheets and folders) return a maximum of 100 records per query and support pagination to return more records. To page through the data, use the pageSize and page parameters in your Smartsheet query. Responses provide totalPages and totalCount values to indicate the total numbers of pages and records, as well as pageNumber and pageSize values. This data can be used in pagination formulas. Append the numericDates parameter your query to return dates in Unix time format (milliseconds). Smartsheet Reports To query Smartsheet reports, you'll need your Report ID. You can find it by running the endpoint /reports/ in a query in Klipfolio, or you can find your report ID in your Smartsheet account properties.